The Repsol Cartagena refinery was the first one built on the Iberian Peninsula. It has an annual crude oil distillation capacity of 5.5 million tonnes, consisting of two main areas: one for fuels production and the other for lubes oil, asphalts, paraffinic and aromatic oils production. Repsol Cartagena is currently involved in an ambitious expansion project where 22 new units will be built to double the refining capacity. The energy system is based around five steam pressure levels, with four fired boilers producing high pressure steam, a cogeneration plant producing steam and electricity, and also a set of steam turbo generators producing electricity. Different potential economic trade-offs provide many challenges to operate the site wide energy system at minimum cost. For instance, the trade-offs among electrical power, steam and fuels networks. In addition, Kyoto protocol introduces a new motivation to calculate and reduce CO2 emissions. This paper describes the tasks performed together with Soteica to develop and implement an on line model to help with the site's energy cost minimization. A detailed model of the steam, fuels, electricity, boiler feed water and condensates systems has been built, including all the interactions between these systems, real plant constraints and degrees of freedom of their operation. Such a model is scheduled to perform automatic executions of the optimization of the entire system and is continually populated with validated live data from the process. A calculation of equipment efficiencies is done as part of the performance monitoring activity of the model. Other monitoring aspects include the continuous auditing of the energy system so the data can be relied on for evaluating the value of energy production and usage, and waste can be reduced or eliminated. Recommendations given by the model are taken into account by operations on a daily basis. The same model used for the online, real time optimization, is also used in standalone mode, populated either with current or historical data, to perform case studies for planning or to evaluate alternatives for a better operation of the energy system. As a result of the project, organization of the information of the refinery energy system into one model and a single environment that everyone has access to has been accomplished. Furthermore, the project has allowed the understanding of all the decision variables and the associated constraints, which sometimes are hidden or ignored. Additionally, the centralization of the responsibilities for the energy system's optimal operation has been achieved. The importance of a proactive support program, which is underway, with the goal of ensuring that the benefits of the project are sustained and that the health of the model is kept in check over time, are also commented. The Repsol Cartagena refinery was the first one built in the Iberian Peninsula. It has an annual crude oil distillation capacity of 5.5 million tonnes, consisting of two main areas: one for fuels production and the other for lubes oil, asphalts, paraffinic and aromatic oils production. Repsol Cartagena is currently involved in an ambitious expansion project where 22 new units will be built increasing the refining capacity to 11 million tonnes a year. An on-line model to monitor and optimize the energy system, which technology was selected based on successful references of similar projects in Repsol (Ref. 1 to 4), has been installed. The energy system is based around five steam pressure levels, with four fired boilers producing high pressure steam, a cogeneration plant producing steam and electricity, and also a set of steam turbo generators producing electricity. Different economic trade-offs provide many challenges to operate the site wide energy system at minimum cost. For instance, the trade-offs among electrical power, steam and fuels networks. In addition, Kyoto protocol introduces a new motivation to calculate and reduce CO2 emissions. 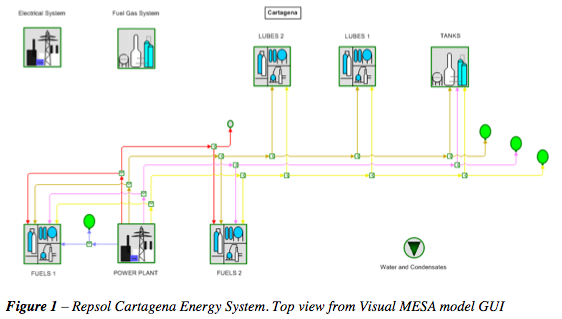 Figure 1 is a screen capture of the main view of the Visual MESA model Graphical User Interface. By double-clicking on the respective icons of each plant area the operators can navigate through the model and inspect the details of each piece of equipment, sensor, header or line. Data collection consists basically in getting system diagrams, Real Time Database tags, and equipment information, plus price related information. Control system review main goals are: to develop a good understanding of how the Visual MESA optimization handles and process constraints are related through the site control system; and to identify any new control strategies or changes to existing strategies that are needed to implement the optimization. This result in making sure that the optimization suggestions can be properly implemented using the site's operating procedures, control strategies and control structure. Software installation is done on a server, accessing the real time database (Plant Information system) via standard OPC DA/HDA interface. Software installation at PC clients is also done for client server access to the model and also to work with the model in standalone mode. Model building and optimization configuration: a detailed model of the steam, fuels, electricity, boiler feed water and condensates systems has been built, including all the interactions between these systems, real plant constraints and degrees of freedom of their operation. 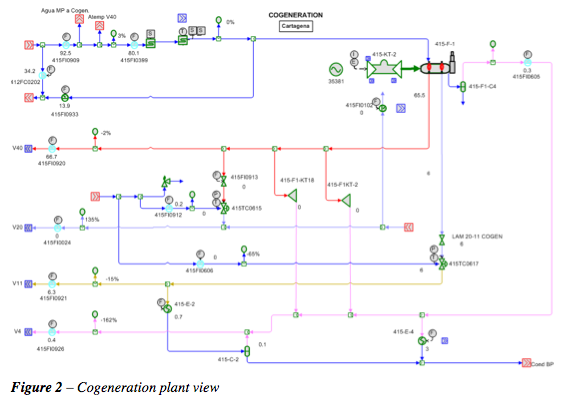 Figure 2 shows the representation of the Cogeneration plant. Such a model is scheduled to perform automatic executions of the optimization of the entire system and is continually populated with validated live plant data. Recommendations given by the model are taken into account by operations on a daily basis. The same model used for the online, real time optimization, is also used in standalone mode, populated either with current or historical data, to perform case studies for planning or to evaluate alternatives for a better operation of the energy system. Midpoint review is done to review the model and optimization with users. At that time the users' training is done. Burn in period corresponds to a fine tuning of the model, operating report and optimization based on Operations feedback in order to reach a day to day use of the application. 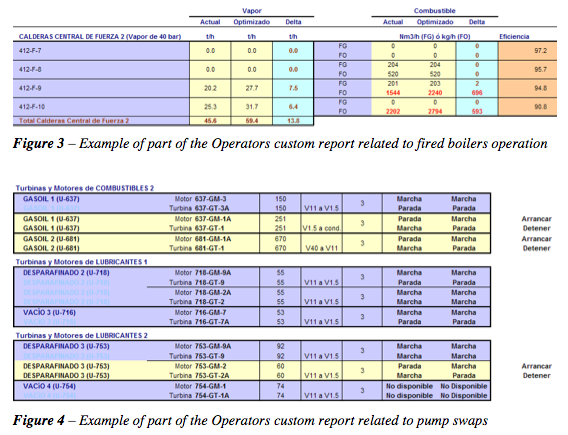 The usual way operators receive the set of recommendations is through a custom report (Figures 3 and 4 shows examples of fragments of such a report with the highlight of the handles). A shift supervisor has been the one indicated as the right person to be in charge of coordinating the changes every day. As a result of the project, organization of the information of the refinery energy system into one model and a single environment that everyone has access to has been accomplished. A calculation of equipment efficiencies is done as part of the performance monitoring activity of the model. 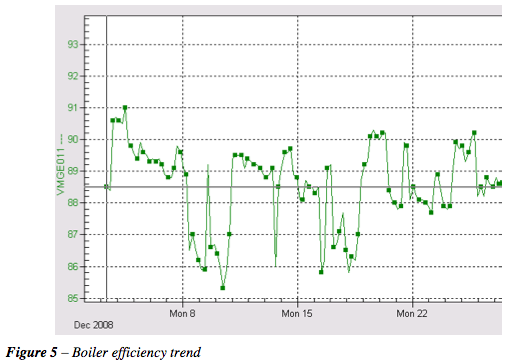 Figure 5 shows the trend of calculated efficiency of one of the boilers. This is not only important to indentify early issues that eventually need maintenance or Operations involvement but also for optimization and better boilers load balance. Other monitoring aspects include the continuous auditing of the energy system so the data can be relied on for evaluating the value of energy production and usage, and waste can be eliminated. Imbalances are flagged graphically by using balloons with different color and size. Figure 6 show an example. This was important to check the current instrumentation and to evaluate the need of new measurements. Frequent and large changes in fuels and electricity prices, has made very important the use of an online model for day to day operation. Some of the operational changes require an adequate planning. For these cases, the model is used in standalone. For example, the day before, the responsible runs the model with the forecasted electricity prices for the next day and decides if it is necessary to consider the operation of the cogeneration unit in a predefined load during the night (instead of base load). Every day the market electricity prices forecast for the day after are available. During the nights, electricity prices usually go down and the convenience to operate the cogeneration at a predefined load is evaluated. Figure 7 shows an example of a plot that summarizes results of this type of what-if planning case study. For the first 8 hours of the day (that is, along night, from 0 to 8 AM) the optimum operating conditions for the energy systems at the site are calculated taking into account the different conditions forecasted for each hour. Main changes correspond to the electricity price, represented in the example in terms of Delta with respect to current price. Also plotted is the delta with respect to base load recommended by Visual MESA at each time and the % of savings with respect to total energy costs that can be obtained with such recommended operating conditions. In this example, the recommendation is to work at predefined load during the whole night. Sometimes, the incentive to do that can be only at one hour during the night. In these cases the change is not applied because it could be not be practical from an operational point of view, based on the time needed to stabilize the process after each change. A planning study like the previously mentioned can be performed easily with the Visual MESA Excel Add-in. Data from different scenarios can be loaded in an Excel spreadsheet. These data is sent to Visual MESA, which simulates the cases and outputs to the same spreadsheet the results. Figure 8 shows another example for a similar study: a parametric analysis of the optimum electric production vs. the electric price. For higher electric prices, the suggestion is to maintain the cogeneration in base load, and the lower the price, the lower the savings (as the income due to electric power export is lower). For prices lower than a certain value, it is not convenient any more to export electricity, and then the Visual MESA recommendation is to reduce the electric production in the cogeneration by shifting to part load operation. The project has allowed the understanding of all the decision variables and the associated constraints, which sometimes are hidden or ignored. Additionally, the centralization of the responsibilities for the energy system's optimal operation has been achieved. A proactive support program is underway with the goal of ensuring that the benefits of the project are sustained and that the health of the model is kept in check over time. 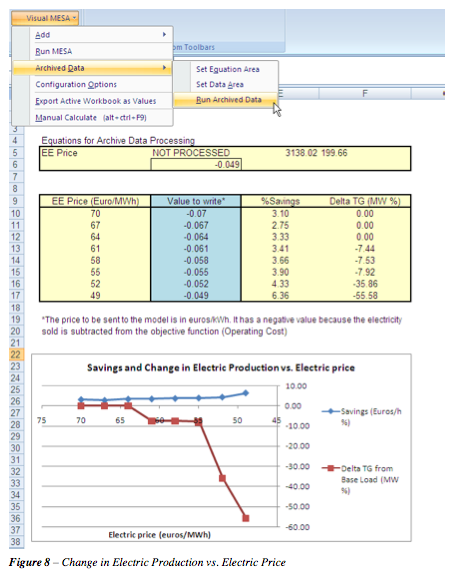 "Energy Costs Reduction By Using an On-line Utilities Optimization Tool", Ruiz D., Ruiz C., Nelson D., Roseme G., Lázaro M. and Sartaguda M., (2004), ERTC Computing Conference organized by Global Technology Forum, May 17-19, 2004, London. "Auditing and control of energy costs in a large refinery by using an on-line tool", Ruiz D., Ruiz C., Mamprin J., Depto Energías y Efluentes Petronor, (2005), ERTC Asset Maximisation Conference organized by Global Technology Forum, May 23-25, 2005, Budapest. "Online Energy Management", Benedicto Calpe, S., Garrote Pazos, B., Ruiz Massa, D., Mamprin, J., Ruiz García, C., Petroleum Technology Quarterly (PTQ), Q1, 131- 138, January 2007. "The Use of an On-line Model for Energy Site Wide Costs Minimization", García Casas, J.M., Kihn, M., Ruiz Massa, D., Ruiz, C., European Refining Technology Conference (ERTC) Asset Maximisation, Roma, Italy, May 2007.